Old Toys What our grandparents played with as children. 1 Old Toys What our grandparents played with as children. 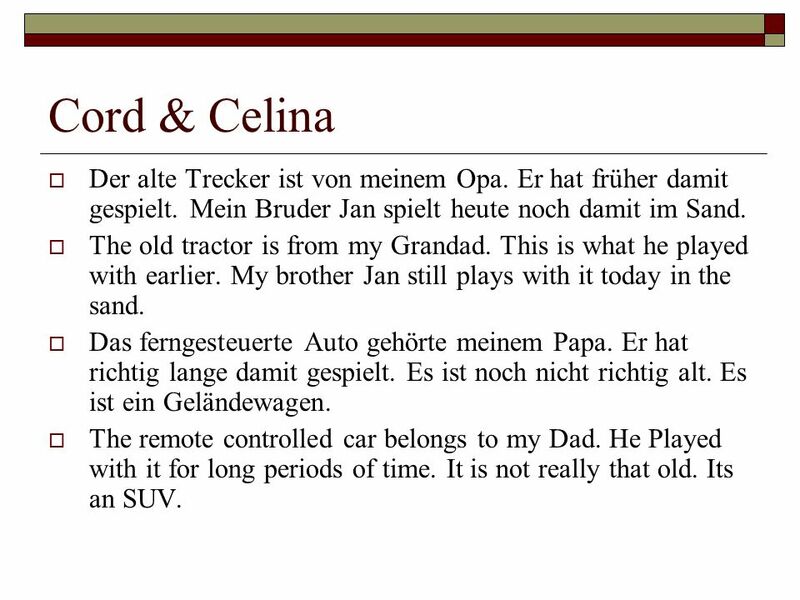 2 Cord & Celina Der alte Trecker ist von meinem Opa. Er hat früher damit gespielt. Mein Bruder Jan spielt heute noch damit im Sand. The old tractor is from my Grandad. This is what he played with earlier. My brother Jan still plays with it today in the sand. Das ferngesteuerte Auto gehörte meinem Papa. Er hat richtig lange damit gespielt. Es ist noch nicht richtig alt. Es ist ein Geländewagen. The remote controlled car belongs to my Dad. He Played with it for long periods of time. It is not really that old. Its an SUV. 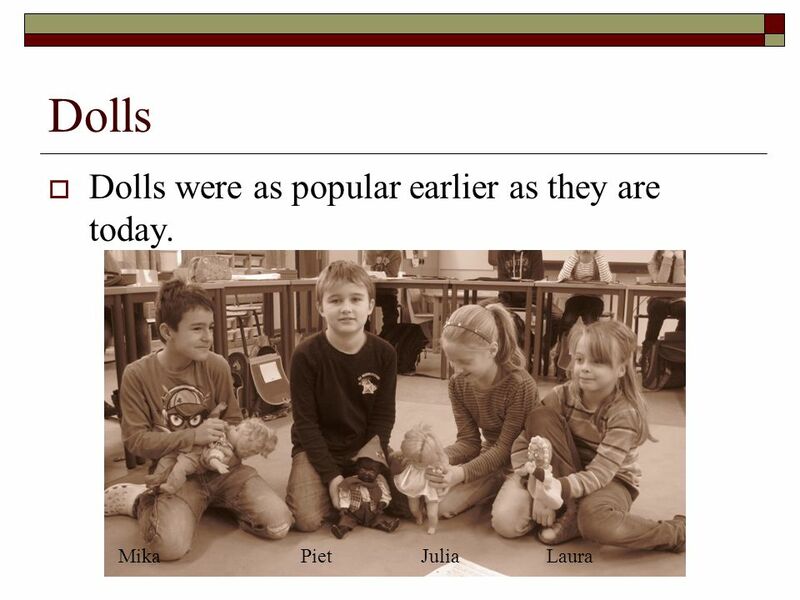 5 Piet & Julia Die Puppe ist 70 Jahre alt. Sie gehört meiner Oma Ingrid. Sie sieht ganz schwarz aus. Oma hat sie zu Weihnachten bekommen. This doll is 70 years old and she belongs to my granny Ingrid. She looks quite black. My Granny got her for Christmas. Meine Oma hat ganz viel mit der Puppe gespielt. Sie hat die Puppe in die Hand genommen und sie mit einem Handtuch eingewickelt. Dann hat meine Oma die Puppe in einen Karton gelegt. Und dann hat die Puppe geschlafen. My Granny played a lot with dolls. She wrapped a blanket around the doll and put her in a box so she could sleep. 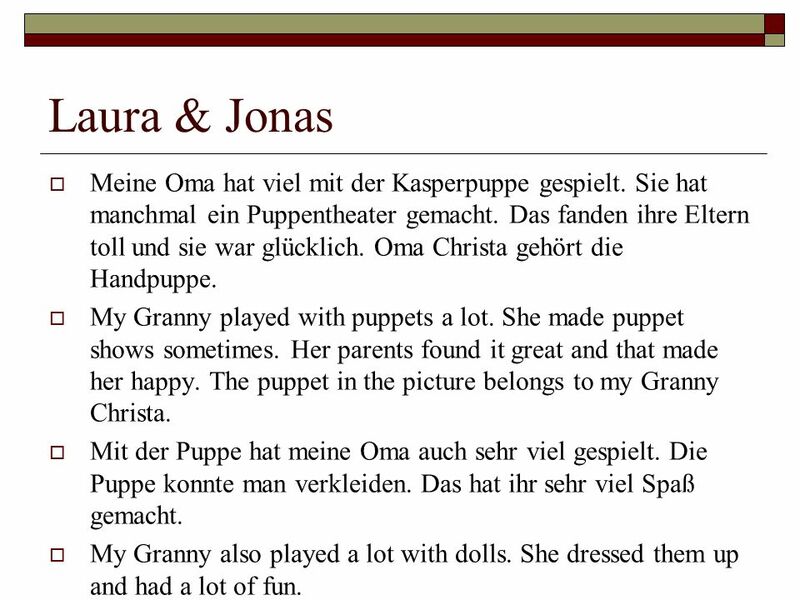 6 Laura & Jonas Meine Oma hat viel mit der Kasperpuppe gespielt. Sie hat manchmal ein Puppentheater gemacht. Das fanden ihre Eltern toll und sie war glücklich. 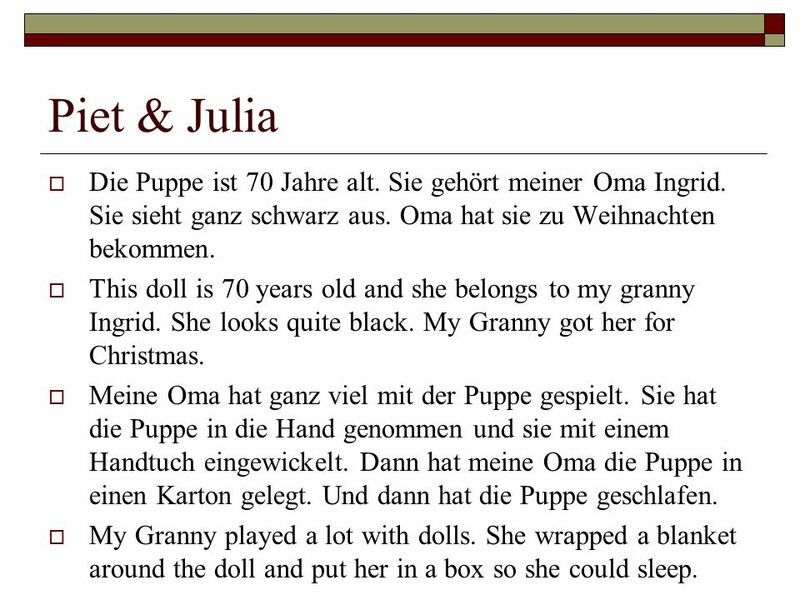 Oma Christa gehört die Handpuppe. My Granny played with puppets a lot. She made puppet shows sometimes. 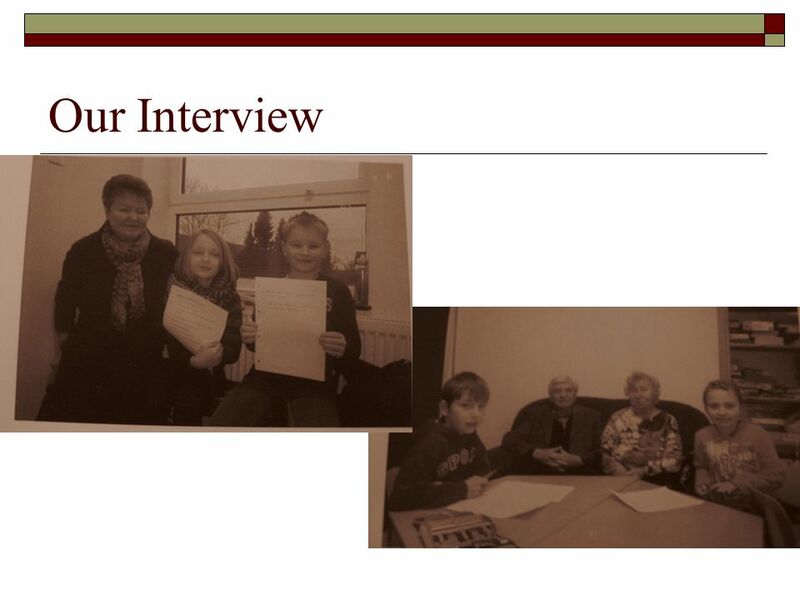 Her parents found it great and that made her happy. The puppet in the picture belongs to my Granny Christa. Mit der Puppe hat meine Oma auch sehr viel gespielt. Die Puppe konnte man verkleiden. Das hat ihr sehr viel Spaß gemacht. 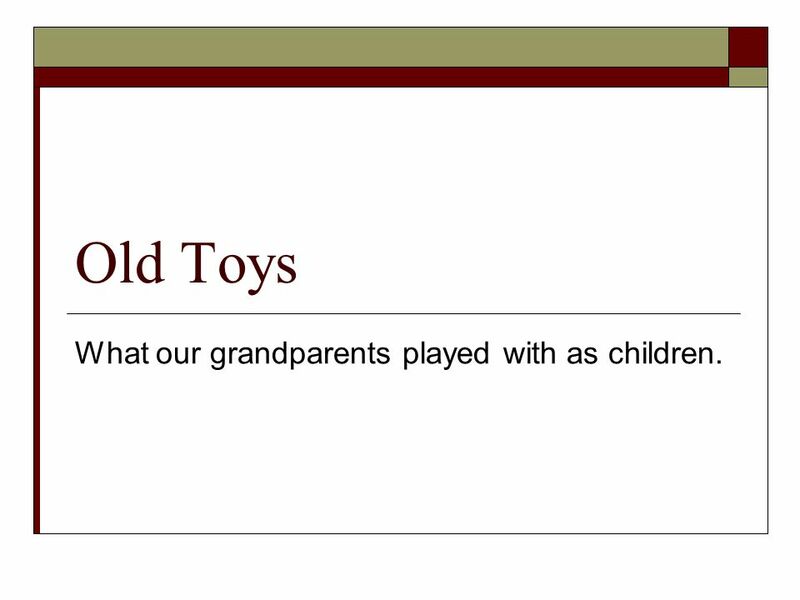 My Granny also played a lot with dolls. She dressed them up and had a lot of fun. 7 Mika Die Puppe Mimi gehörte meiner Tante Kerstin. Die Puppe ist ungefähr 50 Jahre alt. Mimi belongs to my aunt Kerstin. The doll is about 50 years old. Auf den Fotos kann man sehen, wie Kerstin Mimi zu Weihnachten bekommen hat. 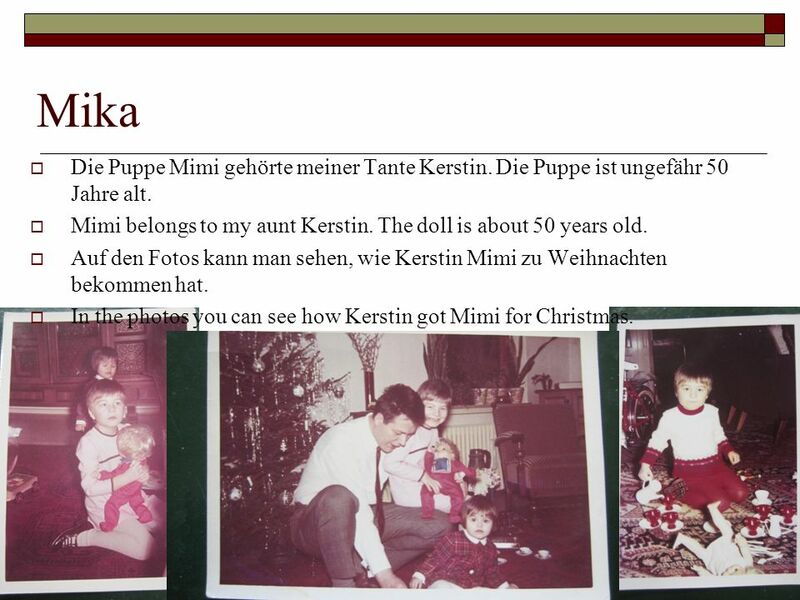 In the photos you can see how Kerstin got Mimi for Christmas. 8 Annika Mit den Indianern und den Soldaten hat mein Papa früher gespielt. Jonas, mein Bruder, hatte die Figuren noch in seinem Zimmer. My Dad played with soldiers and indians. My brother Jonas still has the figures in his bedroom. 9 Jonas Meine Oma hat mit dem Brummkreisel gespielt. Die Brummkreisel haben Musik gemacht, wenn man oben gedreht hat. 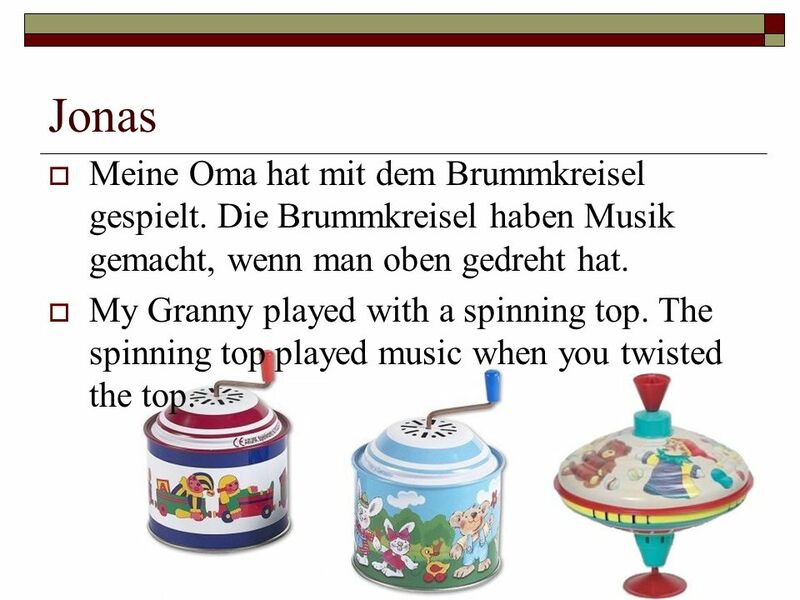 My Granny played with a spinning top. The spinning top played music when you twisted the top. 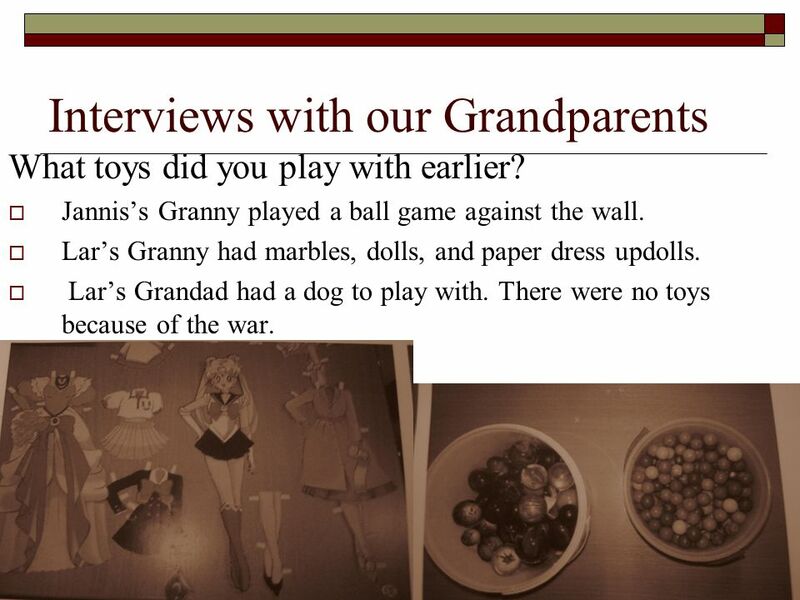 10 Interviews with our Grandparents What toys did you play with earlier? Janniss Granny played a ball game against the wall. Lars Granny had marbles, dolls, and paper dress updolls. Lars Grandad had a dog to play with. There were no toys because of the war. 12 Continued… What was your favourite toy? Janniss Granny had a small stove that she could really cook with. 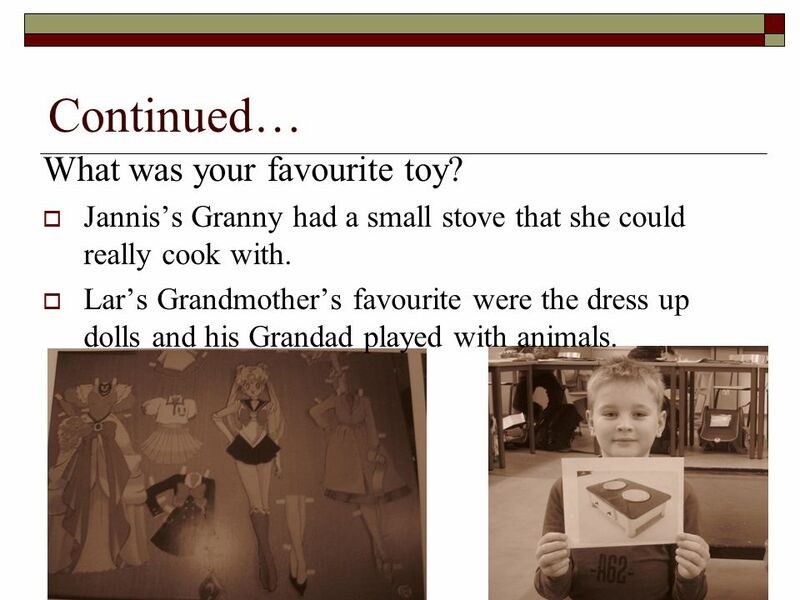 Lars Grandmothers favourite were the dress up dolls and his Grandad played with animals. 13 What favourite toy did you have earlier that you can no longer get today? 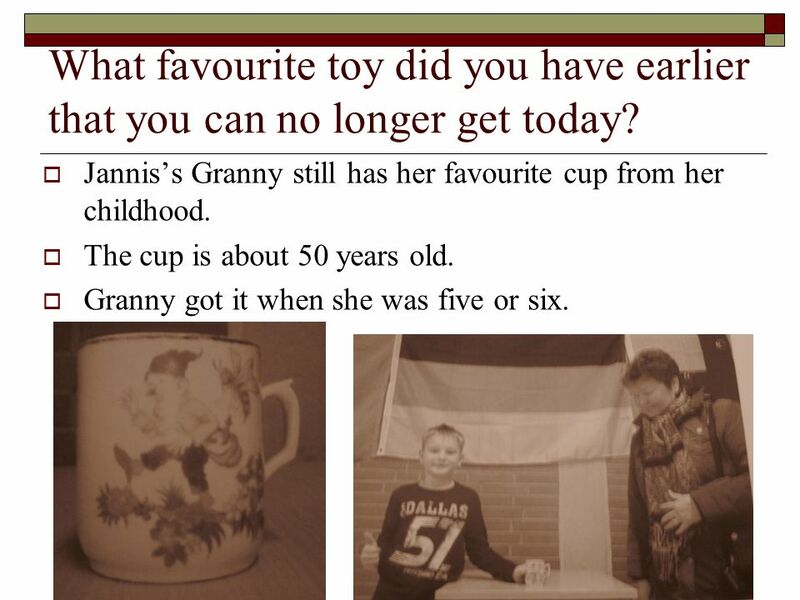 Janniss Granny still has her favourite cup from her childhood. The cup is about 50 years old. Granny got it when she was five or six. 14 Where did you play? Our grandparents liked to play outside, on the farm or in the workshop. They didn t have much time to play as they had to help out at home. 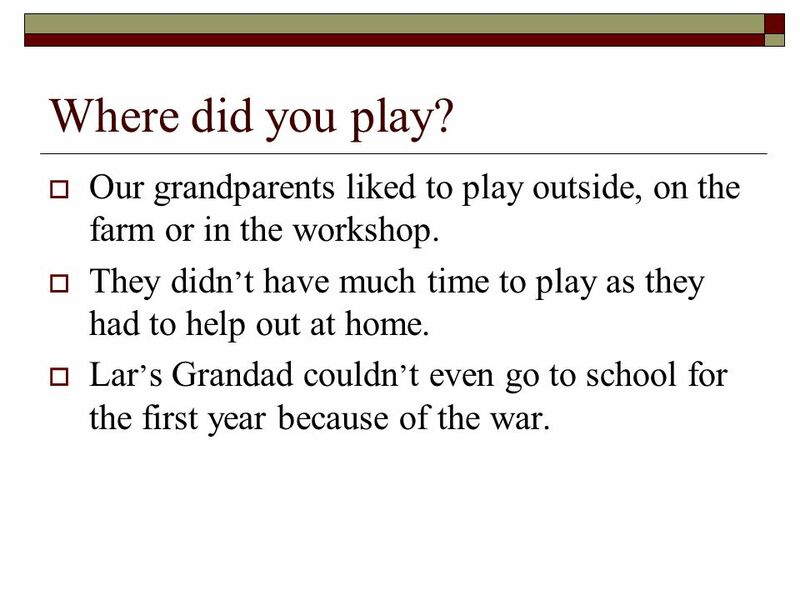 Lar s Grandad couldn t even go to school for the first year because of the war. 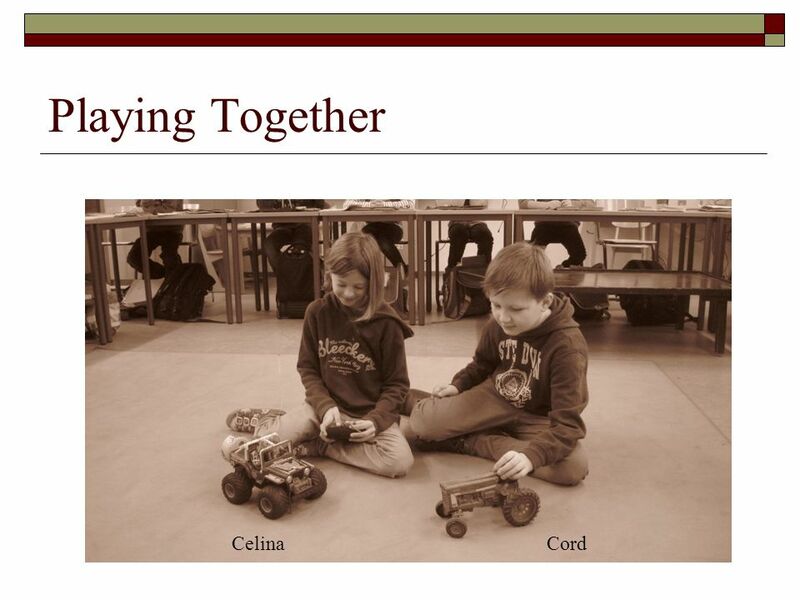 Herunterladen ppt "Old Toys What our grandparents played with as children."